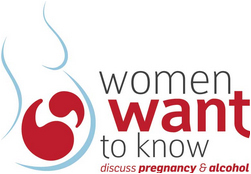 The Women Want to Know project encourages health professionals to routinely discuss alcohol and pregnancy with women and to provide advice that is consistent with the National Health and Medical Research Council’s Australian Guidelines to Reduce Health Risks from Drinking Alcohol. This is the first national campaign targeted at health professionals since the Alcohol Guidelines were last updated in 2009. A survey of 300 health professionals conducted prior to the project found that one in five health professionals had not heard of the Guidelines and more than two in five (45%) were aware of the Guidelines but not familiar with the content. The guidelines state that ‘Maternal alcohol consumption can harm the developing fetus or breastfeeding baby’ and ‘For woman who are pregnant or planning a pregnancy, not drinking is the safest option’ and ‘For women who are breastfeeding, not drinking is the safest option’. Research has also shown that 97 per cent of Australian women want to be asked about alcohol use during pregnancy. The Women Want to Know project was developed by the Foundation for Alcohol Research and Education (FARE) in collaboration with leading health professional bodies across Australia and is supported by funding from the Australian Government Department of Health. There are two main components to the project: (1) resources to support health professionals in discussing alcohol use and pregnancy with women, and (2) accredited training. Read the press release from the Foundation for Alcohol Research and Education here. Learn more about the project and recently developed resources here.